What’s so magical about Magic 7? It depends who you ask. For fans of Last Crack it’s the first time writing duo of Paul Schluter and Buddo have worked together in more that five years. For the former member’s of Madison’s best known hardrock outfit, it’s an opportunity to put the past behind and focus on the present. Last Crack fit the loose parameters of metal that draped the late ‘80s and early ‘90s but in Magic 7 – Crack guitarists Schluter and Don Bakken, bass player Todd Winger, vocalist Buddo (who recently changed his name to Adam Wrathkey) and former Lysergic drummer Jeff Grieshammer – the tones are more progressive, the ranges are more dynamic, and the mood is more musically cohesive than crazed and manic. Despite the more publicized rock outfits that Last Crack splintered into – most notably White Fear Chain, Spiritus and Mind Ox – Schluter and Winger never stopped recording together, four-tracking the material that has become the basis for Magic 7. With their present efforts directed towards a CD release later this year, Magic 7 started recording at Madison’s Sleepless Nights Studio in July. The CD is expected to contain the four tracks from the band’s cassette – the adrenalized crunch of “Drifter” punches Wrathkey’s vocals though a tight guitar grind, “Drowning in a Daydream” wallows in a tranquil cloud, and “Sunrise New Day” and “Forgiveness” are more progressive at the core, highlighting crisp vocals and loosely-strung arrangements – already been laid down, as well as an acoustic song written by Schluter and Wrathkey prior to their forming Last Crack almost a decade ago. “I’m sure we’ve still got a similar sound,” Schluter said when comparing Last Crack to Magic 7, “my guitar and Buddo’s voice definitely have distinct sounds, but I think the songwriting is different. It’s a little less quirky, there aren’t as many quick part changes, it’s definitely more mature. I feel very strong about it, it’s the best songwriting we’ve ever don’t. Magic 7 will be performing in the Ticketmaster New Music Showcase Sept. 6 – East End; Sept. 14 – Mango Grill; Sept. 19 – Regent Street Retreat for the Rock for Musicians Benefit. 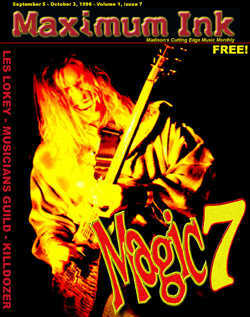 * editor’s note: Last Crack has reunited and more information is available at www.lastcrack.com and Magic 7, Last Crack and other Crack band’s music is now available by download at rokkerrecords.com starting December 15th, 2004.